Originally Submitted to FurAffinity.net on Jan 10th, 2009 04:21 AM. Before it was transferred to Inkbunny it had 176 views and 15 favorites. 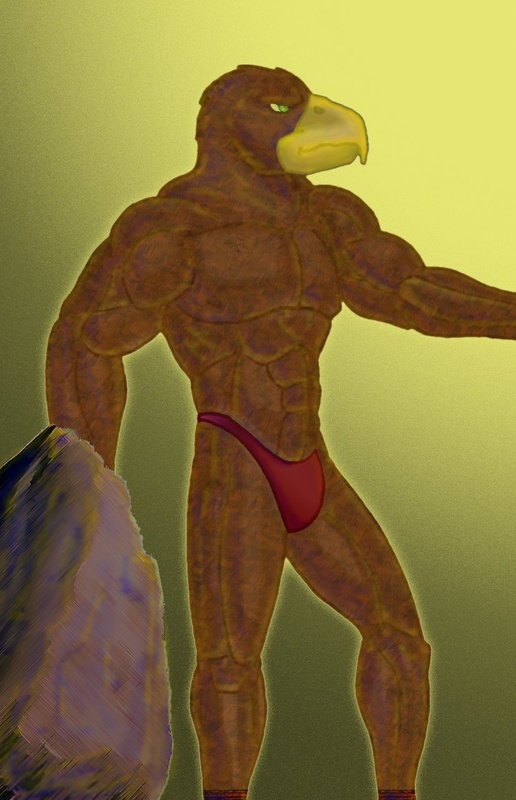 A golden eagle bodybuilder. I put the rock there because he has no hands or feet to that matter. He has socks on because when doing his feathers I somehow manage to not color that smidgen of area and so thought whether to crop it or add the upper part of the yellow feet or have socks. I went the quick way because I did not feel like researching eagle feet at the moment. Of course I could back track but that would take forever and half a day. This is my first art work made with the help of my new Adobe Photoshop Elements 6 that I got for the cheap at the university. The universities may over charge people a lot but at least they have special discounts for students.